The kidneys are bean-shaped excretory organs in vertebrates. Part of the urinary system, the kidneys filter and excrete wastes from the blood, principally nitrogenous wastes originating from protein and amino acid metabolism. One such waste is urea, which is excreted, along with water, as urine. The kidneys demonstrate the remarkable harmony of the vertebrate body, working together with the circulatory, digestive, nervous, and endocrine systems to allow an integrated, properly functioning body. Just as the kidney performs a function for the whole body, removing waste products, it in turn benefits from the other systems in terms of its own maintenance. The medical field that studies the kidneys and diseases affecting them is called nephrology, from the Greek name for kidney; the adjective from Latin meaning "kidney-related" is renal. In humans, the kidneys are located in the posterior part of the abdomen, in the lumbar regions. There is one on each side of the spine. The right kidney sits just below the liver, while the left one is below the diaphragm and adjacent to the spleen. Above each kidney is an adrenal gland (also called the suprarenal gland). The asymmetry within the abdominal cavity caused by the liver results in the right kidney to be slightly lower than the left one. The kidneys are retroperitoneal, which means they lie behind the peritoneum, the lining of the abdominal cavity. They are approximately at the vertebral level T12 to L3. The upper parts of the kidneys are partially protected by the eleventh and twelfth ribs, and each whole kidney is surrounded by two layers of fat (the perirenal fat and the pararenal fat) which help to cushion it. Congenital absence of one or both kidneys, known as unilateral or bilateral renal agenesis, respectively, can occur. In very rare cases, it is possible to have developed three kidneys. Above each human kidney is one of the two adrenal glands. 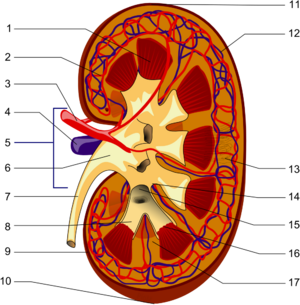 In a normal human adult, each kidney is about 11 cm long and about 5 cm thick, weighing 150 grams. Kidneys weigh about 0.5 percent of a person's total body weight. 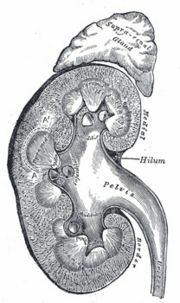 The kidneys are "bean-shaped" organs, having a concave side facing inwards (medially). On this medial aspect of each kidney is an opening called the hilum, which admits the renal artery, the renal vein, nerves, and the ureter. The outer portion of the kidney is called the renal cortex, which sits directly beneath the kidney's loose connective tissue/fibrous capsule. Deep to the cortex lies the renal medulla, which is divided into 10-20 renal pyramids in humans. Each pyramid together with the associated overlying cortex forms a renal lobe. The tip of each pyramid, called a papilla, empties into a calyx, and the calices empty into the renal pelvis. The pelvis transmits urine to the urinary bladder via the ureter. Each kidney receives its blood supply from the renal artery, two of which branch from the abdominal aorta. Upon entering the hilum of the kidney, the renal artery divides into smaller interlobar arteries situated between the renal papillae. At the outer medulla, the interlobar arteries branch into arcuate arteries, which course along the border between the renal medulla and cortex, giving off still smaller branches, the cortical radial arteries (sometimes called interlobular arteries). Branching off these cortical arteries are the afferent arterioles supplying the glomerular capillaries, which drain into efferent arterioles. Efferent arterioles divide into peritubular capillaries that provide an extensive blood supply to the cortex. Blood from these capillaries collects in renal venules and leaves the kidney via the renal vein. Efferent arterioles of glomeruli closest to the medulla (those that belong to juxtamedullary nephrons) send branches into the medulla, forming the vasa recta. Blood supply is intimately linked to blood pressure. The basic functional unit of the kidney is the nephron, of which there are more than a million within the cortex and medulla of each normal adult human kidney. Nephrons regulate water and soluble matter (especially electrolytes) in the body by first filtering the blood under pressure, and then reabsorbing some necessary fluid and molecules back into the blood while secreting other, unneeded molecules. Reabsorption and secretion are accomplished with both cotransport and countertransport mechanisms established in the nephrons and associated collecting ducts. The fluid flows from the nephron into the collecting duct system. This segment of the nephron is crucial to the process of water conservation by the organism. In the presence of antidiuretic hormone (ADH; also called vasopressin), these ducts become permeable to water and facilitate its reabsorption, thus concentrating the urine and reducing its volume. Conversely, when the organism must eliminate excess water, such as after excess fluid drinking, the production of ADH is decreased and the collecting tubule becomes less permeable to water, rendering urine dilute and abundant. Failure of the organism to decrease ADH production appropriately may lead to water retention and dangerous dilution of body fluids, which in turn may cause severe neurological damage. Failure to produce ADH (or inability of the collecting ducts to respond to it) may cause excessive urination, called diabetes insipidus. After being processed along the collecting tubules and ducts, the fluid, now called urine, is drained into the bladder via the ureter, to be finally excluded from the organism. The kidneys excrete a variety of waste products produced by metabolism, including the nitrogenous wastes: urea (from protein catabolism) and uric acid (from nucleic acid metabolism). Most organisms have to deal with the excretion of nitrogen waste originating from protein and amino acid catabolism. In aquatic organisms, the most common form of nitrogen waste is ammonia, while land-dwelling organisms developed ways to convert the toxic ammonia to either urea or uric acid. Generally, birds and saurian reptiles excrete uric acid, while the remaining species, including mammals, excrete urea. Remarkably, tadpoles excrete ammonia, and shift to urea production during metamorphosis. The urea is formed in the livers of mammals in a cyclic pathway, from the break down of ammonia (a metabolic waste)—a process that was initially named the Krebs-Henseleit cycle after its discoverers, and later became known simply as the urea cycle. The pathway has been documented not only in mammals and amphibians, but in many other organisms as well, including birds, invertebrates, insects, plants, yeast, fungi, and even microorganisms. Humans produce a little uric acid as a result of purine breakdown. Urea is essentially a waste product; it has no physiological function. It is dissolved in blood (in humans in a concentration of 2.5 - 7.5 mmol/liter) and excreted by the kidney in the urine. The kidneys regulate the pH, by eliminating H ions concentration called augmentation mineral ion concentration, and water composition of the blood. By exchanging hydronium ions and hydroxyl ions, the blood plasma is maintained by the kidney at a near neutral pH 7.4. Urine, on the other hand, may be acidic at pH 5 or alkaline at pH 8. The pH is maintained through four main protein transporters: NHE3 (a sodium-hydrogen exchanger), V-type H-ATPase (an isoform of the hydrogen ATPase), NBC1 (a sodium-bicarbonate cotransporter) and AE1 (an anion exchanger which exchanges chloride for bicarbonate). Due to the polar alignment of cells in the renal epithelia, NHE3 and the H-ATPase are exposed to the lumen (which is essentially outside the body), on the apical side of the cells, and are responsible for excreting hydrogen ions (or protons). Conversely, NBC1 and AE1 are on the basolateral side of the cells, and allow bicarbonate ions to move back into the extracellular fluid and thus are returned to the blood plasma. In modern day practice, altering urine pH is useful in the management of certain poisoning cases, as it promotes increased excretion of the particular toxic ions. Sodium ions are controlled in a homeostatic process involving aldosterone, which increases sodium ion absorption in the distal convoluted tubules. When blood pressure becomes low, a hormone called renin is secreted by cells of the juxtaglomerular apparatus, a part of the distal convoluted tubule, which are sensitive to pressure. Renin acts on a blood protein, angiotensinogen, converting it to angiotensin I. Angiotensin I is then converted by the Angiotensin Converting Enzyme, ACE, in the lung capillaries to Angiotensin II, which stimulates the secretion of aldosterone by the adrenal cortex, which then affects the kidney tubules. Aldosterone stimulates an increase in the reabsorption of sodium ions and excretion of potassium ions from the kidney tubules which, consequently, causes an increase in the volume of water that is reabsorbed from the tubule. This increase in water reabsorption increases the volume of blood, which ultimately raises the blood pressure. Any rise or drop in blood osmotic pressure due to a lack or excess of water is detected by the hypothalamus, a part of the brain. The hypothalamus notifies the pituitary gland via negative feedback. A lack of water causes the posterior pituitary gland to secrete antidiuretic hormone (ADH), which results in water reabsorption and an increase in urine concentration. Tissue fluid concentration thus returns to a mean of 98 percent. The kidneys secrete a variety of hormones, including erythropoietin and urodilatin, as well as vitamin D.
renal capsule: The membranous covering of the kidney. cortex: The outer layer over the internal medulla. It contains blood vessels, glomeruli (which are the kidneys' "filters"), and urine tubes. It is supported by a fibrous matrix. hilus: The opening in the middle of the concave medial border for nerves and blood vessels to pass into the renal sinus. renal column: The structures which support the cortex. They consist of lines of blood vessels and urinary tubes and a fibrous material. renal sinus: The cavity which houses the renal pyramids. renal pyramids: The conical segments within the internal medulla. They contain the secreting apparatus and tubules and are also called malpighian pyramids. 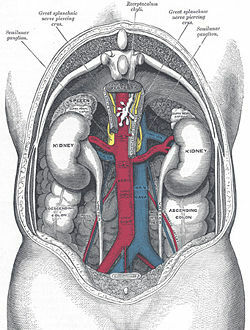 renal artery: Two renal arteries come from the aorta, each connecting to a kidney. The artery divides into five branches, each of which leads to a ball of capillaries. The arteries supply (unfiltered) blood to the kidneys. The left kidney receives about 60 percent of the renal bloodflow. renal vein: The filtered blood returns to circulation through the renal veins which join into the inferior vena cava. renal pelvis: Basically just a funnel, the renal pelvis accepts the urine and channels it out of the hilus into the ureter. ureter: A narrow tube 40 cm long and 4 mm in diameter. Passing from the renal pelvis out of the hilus and down to the bladder. The ureter carries urine from the kidneys to the bladder by means of peristalsis. Medical terms related to the kidneys involve the prefixes renal- and nephro-. Surgical removal of the kidney is a nephrectomy, while a radical nephrectomy is removal of the kidney, its surrounding tissue, lymph nodes, and potentially the adrenal gland. A radical nephrectomy is performed for the removal of cancers. Hydronephrosis - the enlargement of one or both of the kidneys caused by obstruction of the flow of urine. Kidney stones - relatively common and particularly painful disorder. Renal cell carcinoma - the most common form of kidney cancer arising from the renal tubule; the most common type of kidney cancer in adults presenting with painless hematuria, weight loss, and pain in the lumbar regions. Nephrotic syndrome - the glomerulus has been damaged so that a large amount of protein in the blood enters the urine. Other frequent features of the nephrotic syndrome include swelling, low serum albumin, and high cholesterol. Pyelonephritis - an infection of the kidneys frequently caused by complication of a urinary tract infection. Generally, humans can live and function normally with just one kidney, as humans have more functioning renal tissue than needed to survive, possibly due to the nature of the prehistoric human diet. Only when the amount of functioning kidney tissue is greatly diminished will chronic renal failure develop. If the glomerular filtration rate, or GFR, (a measure of renal function) has fallen very low (end-stage renal failure) or if the renal dysfunction leads to severe symptoms, then renal replacement therapy is indicated. Such therapy includes dialysis or renal transplantation. Irshad, Abid, and S. Ackerman. 2005. Horseshoe Kidney WebMD, 2008. Retrieved February 12, 2008. This page was last modified on 3 April 2008, at 22:10.